It’s been a few days–life was crazy with Halloween events and the actual day itself, but now we’re in November, which means the Christmas music can start coming out in full force. After all, the store shelves are full and the song “It’s Beginning to Look a Lot Like Christmas” is appropriate much earlier–much much earlier than it did when it was written. I know, I know, there are some purists out there who think we shouldn’t have any hint of decking the halls until after Thanksgiving, but come on! There’s just SO MUCH good music, it has to be shared. Today’s selection is a practically perfect album from the 1960’s, by one of it’s most popular folk groups. Some hidden gems you’ll love. The New Christy Minstrels were a folk pop group founded in 1961. They won a Grammy Award in 1962 and had a huge hit with a song called, “Green, Green.” An unusual folk group in that it had 14 members, they had a bright and lively sound. Spoofed beautifully as “The New Main Street Singers” in Christopher Guest’s A Mighty Wind, the New Christy Minstrels launched the careers of such artists as Kenny Rogers and Kim Carnes, Gene Clark and Barry McGuire. However, of all their albums, none is better and more timeless than this 1963 album. Featuring a number of original songs as well as some traditional tunes, it’s a beautifully sung and arranged collection. Every song is sung by the group, with several solos throughout. Standout new songs are “The Shepherd Boy, “Christmas Wishes,” and “Christmas Trees.” These are all quiet, somewhat contemplative songs, and at least one, “Christmas Wishes,” should have discovered a life away from this album. Whether you like folk music or not, this is a standout addition to your Christmas collection. 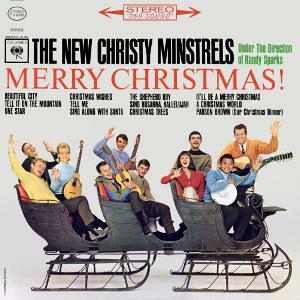 This album was recorded at the height of their popularity, and much higher in quality than the later Christmas collection called Christmas With the Christies. While this later collection is still quite good, there isn’t an original song in the bunch, which is disappointing since the best songs on Merry Christmas! were all new. Sadly, this album, by itself, is no longer available. It is available with the second album on a collection recently released called Christmas with the New Christy Christies: Complete! You can order it from Amazon here. Here’s my favorite song from the album, the short and beautiful Christmas Trees.